HELLO FRIENDS AND BUDS! Say hey what's up hello to issue #13. Welcome to the new subscribers! I don't know what happened between issue 12 and now (well, except for the months January, February, and March), but there are a lot of you. This newsletter is focused on comedy and satire writing and features interviews with writers about their process, submission opportunities, and relentless self-aggrandizement from me, Caitlin Kunkel! It's my newsletter, after all! Wow, a lot has happened on my end since the last newsletter! With the other editors of The Belladonna, Brooke Preston, Carrie Wittmer, and Fiona Taylor, I wrote a piece for McSweeney's called "New Erotica for Feminists." The piece went viral, being shared on Facebook alone over 100,000 times in the first few weeks it was out. Then we were contacted by a publisher in the UK. Then we got a lit agent. Then we got a book deal! NEW EROTICA FOR FEMINISTS: Satirical Fantasies of Love, Lust, and Equal Pay is coming out in NOVEMBER 2018!! It will be published by Sceptre, an imprint of Hodder & Stoughton in the UK, and Dutton/Plume, imprints of Penguin Random House in the US!!! So that was super exciting! Much more on the book as we get closer and we finish writing it and get a cover and all that stuff! 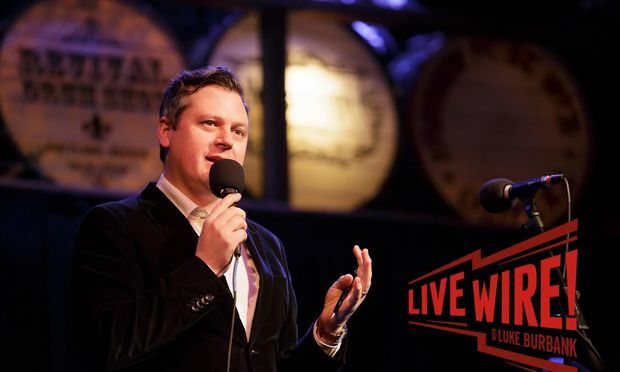 I'm also back as the writer for Live Wire with Luke Burbank, a public radio show distributed by Public Radio International and taped live in Portland, OR. Subscribe to the Live Wire podcast here! In March, The Belladonna editors taught a writing workshop and facilitated a show at Brown University (alongside awesome student groups Skorts and The Rib). We now travel with our workshop and shows, teaching students how to write satire/humor with a strong POV and how to come up with formats for pieces. Reach out if your school or organization wants to know more! I'm very excited for this issue because I have interviews with two excellent NY-based writers and performers: James Folta and JiJi Lee. Let's dive in! I'm heading back down to Washington D.C. May 12 and 13 to teach two workshops at Washington Improv Theater - one an introduction to satire, and the other a more advanced topical workshop. Check them out! This month I spoke to writer JiJi Lee! JiJi is a comedy writer and storyteller in NYC. Her humor writing has appeared in Reductress, The Belladonna (I highly recommend this piece! ), The New Yorker, and The New York Times. She's appeared on the RISK! podcast several times, and you can catch her around NYC. You can find her on Twitter @thejinius, and on the interwebs here. JiJi, you have a reputation as a storyteller and that's something you've worked on for years. What drew you to that field? I wanted to do comedy but I wasn’t sure in which field. I tried stand up but the set up/punchline format was hard for me. Then I read David Sedaris’ Me Talk Pretty One Day and it was life changing. He was telling stories about his family, his job, his partner--everyday life--and they made me me laugh till I snorted! I immediately googled everything about David Sedaris and found out about This American Life, which then lead me to googling storytelling shows in NYC. I started doing mics, I signed up for David Crabb’s storytelling class at The PIT, and for the first time, I found something that felt like a natural fit for me. And what I liked about storytelling is that the things you feel insecure/self conscious about--like being an Asian woman in comedy or being a hot mess--are the things that make you unique and that you can draw stories from. That is a big lesson I learned from reading Sedaris as well. How do you know if something in your life is ripe to be told as a story? An embarrassing experience usually makes for a good story. If it was embarrassing, that usually means there were other characters involved, characters you wanted to impress, and that has built in stakes. Or a story about a time you really wanted something. A good story has high emotional stakes. Probably one about a guy I really liked, but I couldn’t tell he was uninterested, even after he didn’t respond when I emailed to tell him that I got hit by a car. Unrequited love is always fun! can't even get an email back for this?? Is there anything in your life that is totally off limits for that format? I guess any experience that I’m still emotionally processing is off limits or an experience that is clearly not meant to be a story but just a whine/rant. After all, I’m doing this for comedy and entertainment. I don’t want to use the audience as a proxy for my diary. Although you've gotten into conceptual humor writing more recently, you have broken into two MAJOR publications in the last year - Daily Shouts in The New Yorker, and Loose Ends in the New York Times. CONGRATS!! How did you come up with the ideas for those two pieces? Thank you!!! I came up with "What Should I Watch on Netflix" while, you guessed it, on Netflix. I think it’s funny how technology can lead to self loathing and I thought a parody of Netflix categories could capture that. "With How to Break Up With a Friend Who Has Snakes for Hands," I had a weird image of a person with snakes for hands and wondered what it would be like to be friends with that person. Around the same time, I read an article about toxic relationships and the advice in it was very odd and conflicting. Like the article would say “watch out for emotionally manipulative people!” and then their solution would be, “just talk to them!” So that inspired my format. How did it feel to hold the print edition of The New York Times with YOUR PIECE in it?? I felt like a little kid holding up a drawing she was proud of! Actually, my drawings were never good enough to make it onto the fridge door, so the NYT piece kind of made up for that. What advice do you have for performers who are looking to start getting into this sort of writing? How did you start to transition into this field as well? I would recommend reading humor sites regularly. I guess that’s a given, but aside from reading humor, it’s also good to see what these sites are publishing and what makes their pieces distinct. Like a Reductress piece is going to have a different voice and style than a Loose Ends piece. I think knowing what these sites are looking for is like half the battle. I started by reading a lot of Reductress and being a big fan and reaching out with my pitches. I also did that with Above Average. Then I took Elissa Bassist’s humor writing class at Catapult, which I highly recommend! I think it’s good to invest in your writing and learn from other people who have been in the trenches. Also, Elissa is super cool and supportive so I would just take her class for that! You also write screenplays and TV. How does that fit into your storytelling and humor writing life? I think the storytelling and humor writing have been in service of my TV writing. I’ve always wanted to write for TV and I wanted to hone my story and joke writing. While I initially got into storytelling because it was fun, it’s helped me learn the TV format, knowing about goals and obstacles and all that. And the humor writing has helped with joke writing and being clear about what’s funny about this scene or character and how to heighten that. I think people who exercise refer to this as "cross training." What are you currently working on in this format? I’m writing a Broad City spec script that I’m hoping to get in shape for the upcoming teleplay contests. It’s been very fun writing in that show’s voice--writing in Ilana’s voice has been particularly liberating! What's one piece of writing advice you have for people that you rarely follow yourself? And what's one that you DO follow? I learned about this from a podcast interview with TV writer Megan Ganz. She talks about writing on Community and how they had this process called a “Spit Draft”. You purposefully blow through tough scenes as fast as possible and instead of typing out the dialogue, you would type out the subtext of the scene. So a character would say “I’m mad at you Jeff because blah blah blah!” The point is to get the shape of the scene and fill it in later. So if I’m drafting a humor piece and having trouble coming up with a joke, I’ll write “I”m saying something sexist and offensive now” or “I should go off the rails here and have a breakdown.” I find that by clarifying what it is I’m trying to say, I can then find the jokes that fit that purpose. Events or projects to plug? I’m doing Bangs! A storytelling show on Sunday April 15, 7:30 pm, at Pine Box Rock Shop in Brooklyn. LINK ROUNDUP! GETYA LINKS HERE! This is an oldie, but goodie - "Do You Want to Be Known For Your Writing, or For Your Swift Email Responses?" by Melissa Febos on Catapult. Especially love this section: "Stop trying to get an A+ at anything but writing your best work." This article in The New Yorker from a few years ago made me start a book club and be more conscious about what I was choosing to read: "Can Reading Make You Happier?" More places need a writer-in-residence - pet stores, bakeries, retirement homes, Verizons - let's make it happen! "This Woman Wrote Her Novel at a Tire Store and Now They Are Her Biggest Fans." I also really liked this interview with writer/director Gail Lerner on Hello Sunshine talking about the many shapes her career has taken. I liked this new talk from Austin Kleon, he of "Steal Like an Artist" fame. I'm also very excited to have spoken with the great James Folta! 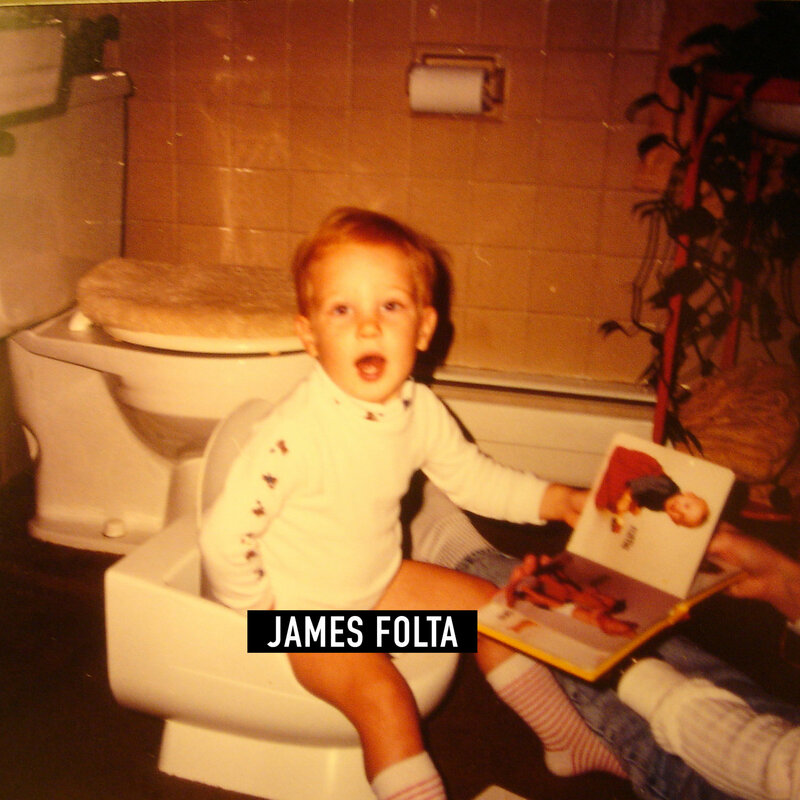 James is a writer and editor based in Brooklyn. He performs improv on Harold Night at UCB. He’s online at jamesfolta.com and on Twitter. James, you're someone who both writes and performs a lot of comedy - you've been on a Harold team at UCB for a while, and you have a VERY long list of credits. How did you start in both performing and writing? Oh wow, I’m blushing! I guess I’ve always been interested in comedy — my parents are both very funny and extremely film and TV literate, so I started on a solid foundation. But I got started writing and performing in college as a member of two sketch comedy groups. After I graduated, I moved to San Francisco and found myself without a group of people to perform with, which is when I started writing and submitting short humor to McSweeney’s and elsewhere. That’s also when I met a bunch of folks who would go on to found Endgames Improv and started learning how to improvise. Do you feel that improv can inform your writing, and vice versa? I think initially for me, a proclivity for writing was detrimental to becoming a good improviser. It’s hard to perform when you’re trying to write the show that you're in. You end up plotting and planning on stage as the show passes you by. I needed to let go of that writer’s desire to control and direct before I was able to start having fun improvising. But the upside to the transference of power from my mind to my gut that came from doing more improv made me less precious with my writing. You can sit and stare at a blank piece of paper forever until what’s in your head feels worth writing down. That sort of perfectionism can be debilitating and improvising helped free me from it. When you spend time creating a show live, on stage, and that is simultaneously the first and final draft, writing feels comparatively boundless. There's just a lot less pressure to writing as compared to a live show and it let me feel looser and able to experiment and explore in my writing. After all, unlike an improv show, no one has to see writing until you want them to. 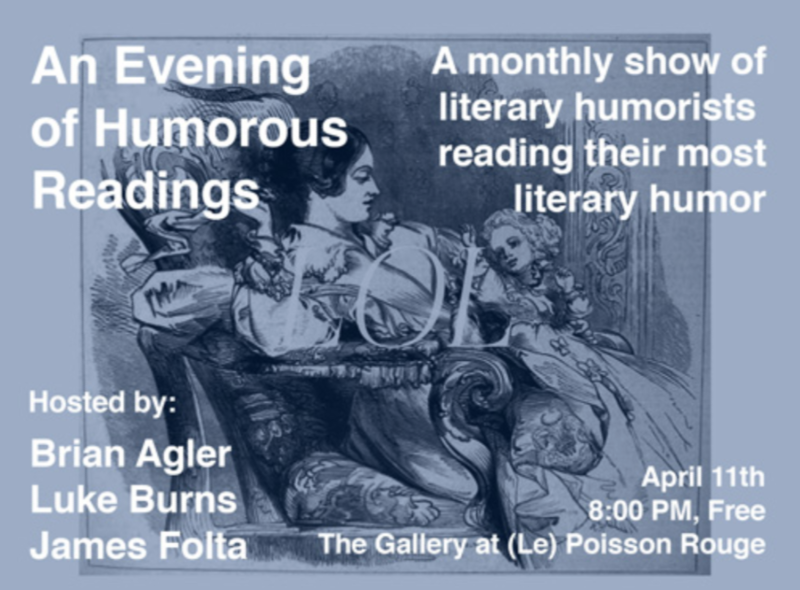 You've hosted An Evening of Humorous Readings with Luke Burns and Brian Agler for years. To my knowledge, it's the only consistently running show in NY featuring written humor pieces read out loud to a live audience. What was the impetus for that? 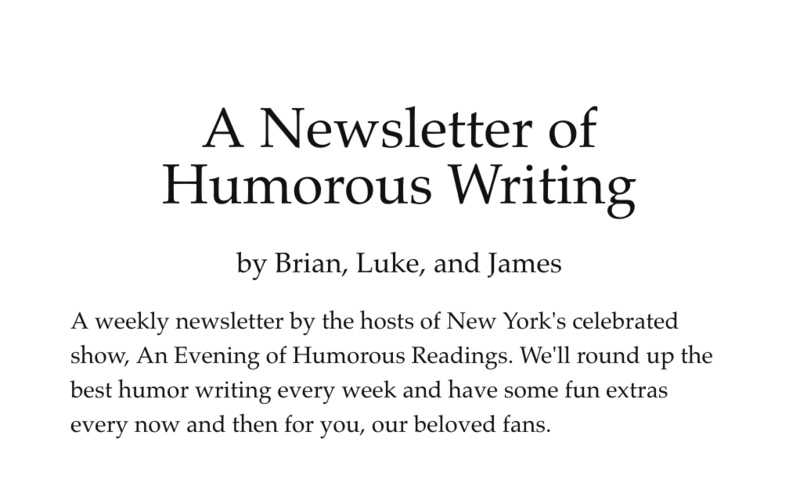 Luke, Brian, and I became buds because of our shared love of comedy and especially of written humor — we've always edited each other's work and spent a lot of time talking about what we're reading. Comedy pals, knowing that we were publishing humor, would book us to read on their shows, but the performances never went as well as we wanted. It’s hard to present writing alongside stand-up, or sketch, or improv — it’s just tonally too distinct and requires a different sort of attention and engagement from an audience. We decided the best way to get the kind of crowd that would listen to and appreciate writing was to create our own show where we can set the expectations. The show has grown into a space for us to connect with other writers, meet people we admire, and workshop new work. Plus it gives us a deadline to write new pieces, which is great. We were lucky to find a home for years at HiFi Bar (Rest In Power, HiFi) and now at le Poisson Rouge, and get the chance to build a little community of writers. Do you have a written piece that performed really well? Two pieces that have run in The New Yorker have also done pretty well on stage: "The People Who I Imagine Live in The New High-Rise In My Neighborhood" and "Congressional Daydreams." I think this format of short, punchy paragraphs organized around a theme tends to do well in front of a crowd. Why do you think some pieces work better read out loud than others? I think pieces that have a strong and clear framing tend to do best. When an audience has some idea of what to expect — what's being explored, from what point of view, what kind of jokes, etc. — they can concentrate on the jokes and the writing without having to worry too much about keeping up with where the piece is going. Stuff that is closer to monologue, with a strong voice, always tends to do well on stage, since they're basically just solo sketches. I've also found that, while they perform well on social media, pieces that have a huge, jokey headline and then just sort of reiterate that headline over and over, don't do as well on stage. You'll get a big pop of laughter up top and then diminishing recognition laughs as the same idea is retold. I think we've all had to start thinking about our headlines more, but I'm happy to report that this trend isn't rewarded as much on stage. The three of you recently added a newsletter to your event that goes out weekly. I love it and think it's a great resource both for new pieces, and for some older classics I might have missed. What was the thinking behind creating that, and how time consuming is it to put together? Glad you like it and thanks for reading! The newsletter came from conversations Luke, Brian, and I were already having amongst ourselves. As long as we've been friends, we've shared writing and articles with each other, talking shop about what we like and why. At some point, we decided to formalize our informal chatting into a newsletter. The idea is to present a short, easy to digest collection of what we liked each week, along with whatever else seemed relevant and interesting, to share with other like-minded nerds. It's so far been really easy to put together and keep up with (knock on wood), since we explicitly kept the scope and length of each newsletter tidy. The process is pretty straightforward: we bookmark what we like in a shared Google doc and add a couple of jokes and thoughts. Plus we rotate weekly who is responsible for compiling the 'letter, so each of us only needs to tackle it once every three weeks. In recent years you've been involved in not one but TWO satirical parody magazines - The Neu Jorker and Paul Ryan Magazine. How did you get started with that, and what is the appeal? The Neu Jorker was an idea that came out of a love, hate, and fascination with The New Yorker that Andrew Lipstein and I share — we met doing comedy but grew closer talking about books and magazines. Sometime around New Year’s 2016, we hatched a plan to make a complete, cover-to-cover parody of an entire issue and jumped immediately into making it before we realized how insanely hard it would be to realize the idea. Not only did we pull it off, but it got enough notice and kind press that we immediately started brainstorming another satire project that could heighten on the surreal weirdness of TNJ, which is where Paul Ryan magazine came from. We decided that instead of parodying one magazine, we would parody as many magazines as we could, with all the pieces in this magazine-about-magazines anchored around a shared topic, the dirtbag Representative from Wisconsin's First District. In the summer of 2016, it seemed like Ryan would be one of the major GOP figureheads left holding the bag after what we all thought would be an inevitable Democratic win, and so would be the perfect satirical target. But of course, the wheels came off in November and we've been tumbling ever since. We had to rejigger Paul Ryan Magazine to make it meaner and sharper and ended up with this 192-page print behemoth full of jokes and jabs about the Speaker. I think the appeal of these projects comes primarily from a love of print — I love books, magazines, zines, everything — and to make one of them was always a big goal of mine. But also as a writer and editor, I love the scope of these projects. The inclination towards creativity is ultimately a pathology of dissatisfaction, in that you are always desirous of something more, something better, bigger, and more ambitious. Making a magazine felt like a natural next step. It was fun to try and bring the satire I'd been working on in short pieces to a broader scale, where it could land bigger and harder. I have to say that the only reason we've been able to pull off these insane ideas is because of the talents and hard work of all the people who contributed and gave us their trust. Any success that these projects have enjoyed is owed completely to the great folks who lent us their skill. You recently became the managing editor for Points in Case - congrats! Why are you looking to do more editing, and what is that site in particular looking for? Thanks! It's been really fun so far and I'm learning a lot every day. I think I was initially drawn to editing through the Neu Jorker and Paul Ryan projects. There's something really great about pulling together many voices and talents and making something more coherent and broad out of them. Editing has also been a nice way to finally put to use the taste and sensibility I’ve developed over years of thinking about this kind of writing, how it works, and how it can succeed. I really like humor writing and it's nice to find a place where that's useful. PIC’s little tagline is "enlightening and irreverent comedy" and I think that's a nice way of crystallizing what the site is looking for. We're open to articles that are funny and thoughtful from all perspectives and voices. We’re willing to take risks on stuff that might not have a home elsewhere, as long as it’s funny. Any tips for people submitting to PIC? First of all -- send us stuff! Don't be scared to pitch, please. I'm trying as best as I can to be thoughtful and offer notes and chances to draft, rewrite, and repitch pieces. Having been on the other side of editorial emails for so long, I'm trying to be as considerate and attentive as I can. The kind of writing that I find myself gravitating towards for the site are things that are funny, clear, and somehow unique. A piece should be able to stand on its own and not take too much work for the reader to figure out. Trust your voice, too. We can tell when you’re passionate, and we can tell when you’re just regurgitating a paint-by-numbers humor piece. One note I've been giving a lot on submissions: pieces ought to have a clean frame, through-line, or spine that runs through the writing. I think all of us like to think that we’re funny enough writers that we can just sort of meander and be funny and breezy and charming. But in reality, that unfocused but compelling writing is incredibly hard to pull off, so giving some thought to a clear framing for a piece goes a long way. On a similar front, I’d also advise PIC submitters to give some thought to the best format for an idea. Between lists, guides, narratives, essays, letters, etc., there are lots of forms a piece can take. I’ve been seeing submissions that jump between a few different formats, which is confusing, and submissions that are framed in a way that constrains the idea. It’s worth trying a few different formats to find the best fit for your idea. Kermit is out here trying to find the best format for HIS piece! Ah geez, probably all of them. One of the things I love to beat myself up about is that I get lazy about using cliches and deploying the same phrases and constructions over and over. It’s easy to use the same language you're comfortable with and not challenge yourself to experiment. I bet I used “I think” in these answers about a thousand times. I'm also trying to get better about rewrites and finishing things. I have a lot of ideas I haven’t attempted yet and a lot of stubs and half-written things that I haven’t gone back to. I’d like to finish more things before I start new things. I’ve lately been good about writing every day (knock on wood again). It’s important to show up and treat writing as a practice. Because frankly, writing is really tough and lonely, but having written is the best thing in the world. You can’t get to that joy of having created something without sitting down to do it. Also, I never submit something before I've gotten some feedback from other writers. I think it’s so important to get an outside eye on stuff before you let it loose on the world. One of the best things that ever happened to improve my writing was finding people whose opinions and taste I trust, and who I can rely on to send me thoughtful, honest notes. I forget who told me this but I've found it helpful: if I'm having trouble finding a way into a piece, or struggling to find an angle on an idea, I'll ask myself, "what about this is funny to you?" You should be able to articulate, relatively succinctly, what about an idea appeals to you. It's an easy way to crack tough ideas and get to the sweet comedy goo inside. — Our reading night is coming up this Wednesday! Show’s at 8pm, doors are open at 7pm, downstairs at (le) Poisson Rouge (www.lpr.com/lpr_events/humorous-readings-april-11th-2018) We’ve got Ariel Dumas, Ginny Hogan, and River Clegg performing! They're all great. 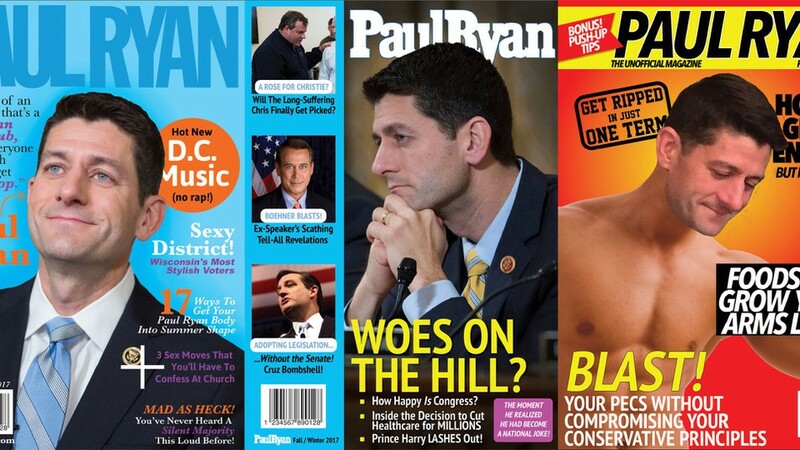 — We still have copies of Paul Ryan magazine available! Grab ‘em at www.wiscohunk.com. — I still have a bunch of 1” Neu Jorker buttons, if anyone wants one of those. Find me on the web and I can mail you some! — Come check out Harold Night. I'm up most Tuesday nights at the new UCB Theatre in Hell’s Kitchen. — Subscribe to our newsletter at www.tinyletter.com/HumorousWriting. Ever wanted to write for radio? HERE'S YOUR CHANCE to pitch an idea! Applications close April 20th! Those of you who write TV - the next round of contests and fellowships are coming up. Make sure to hit the Austin Film Festival deadlines, the regular one is April 20th, and the late one is in May. 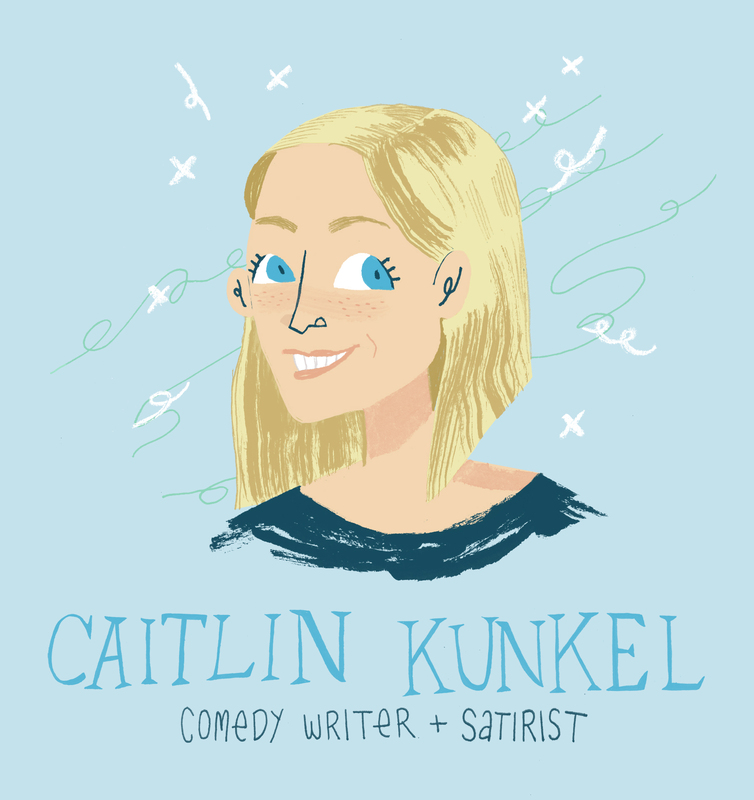 ABOUT ME: Caitlin Kunkel is a comedy writer, satirist and famed pizza scientist based in Brooklyn, NY. Her work has been featured in Shouts & Murmurs in The New Yorker, The Second City Network, McSweeney's Internet Tendency, Reductress, and other places across the vast internetz. She created the online satire program for The Second City and teaches monthly classes for them. She's the writer for Live Wire Radio, distributed by Public Radio International. 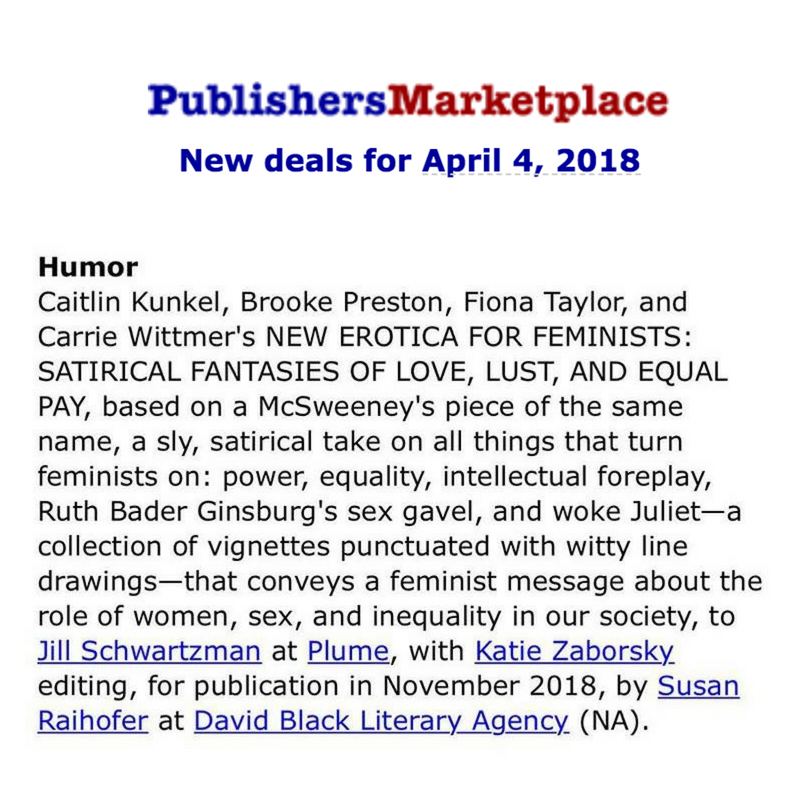 Her first book, NEW EROTICA FOR FEMINISTS, co-written with Carrie Wittmer, Brooke Preston, and Fiona Taylor, will be released by Dutton/Plume in the US and Sceptre in the UK in NOVEMBER OF 2018!!! GUESS WHAT? Caitlin is also the co-founder and editor of the comedy and satire site for female writers, The Belladonna. 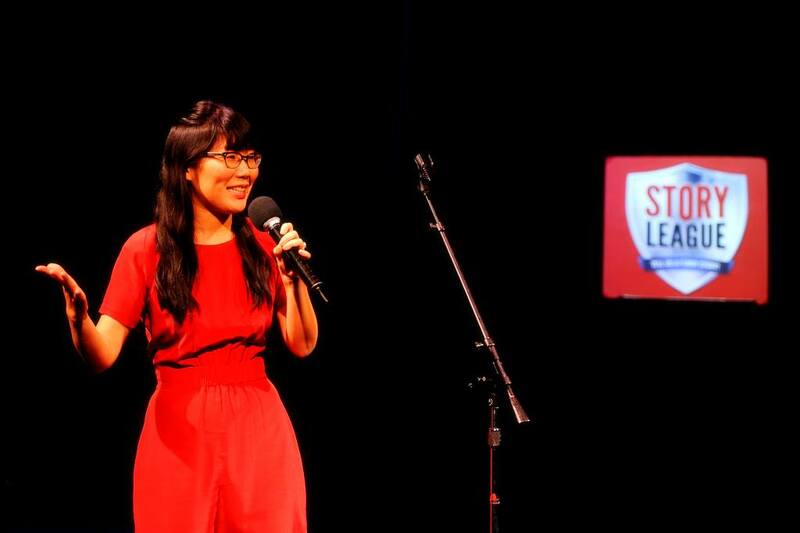 She reads her humor writing and performs improv on filthy stages all across New York. 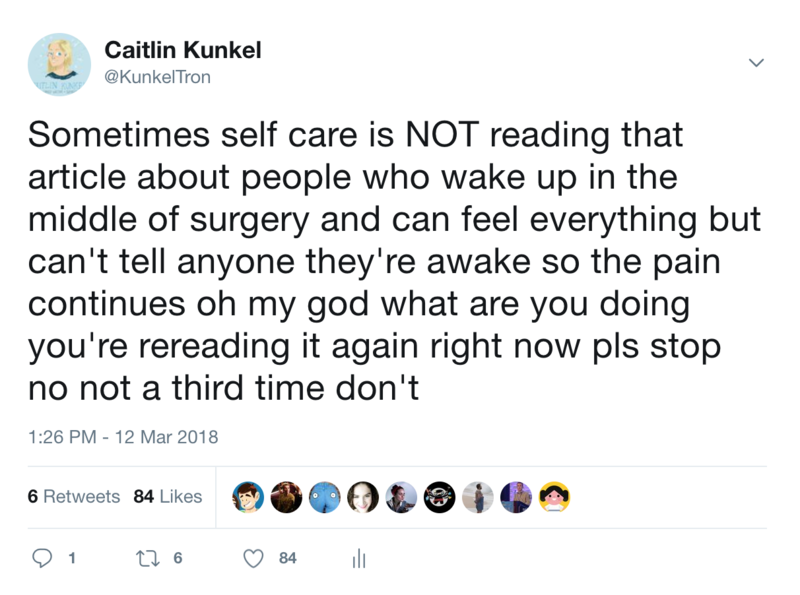 Subscribe to her newsletter for writing advice, submission opportunities and excellent pics of cute animals and follow her musings on Twitter @KunkelTron. Copyright © 2018 KunkelTron, All rights reserved.